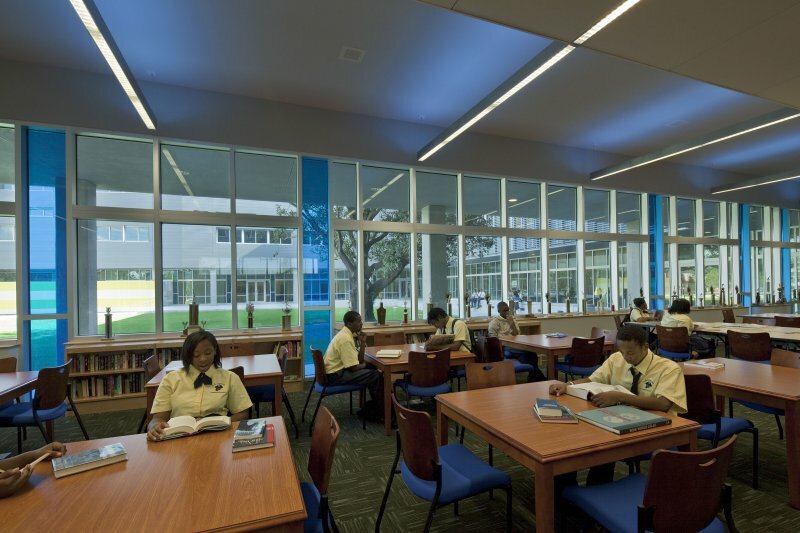 This 235,000-square-foot post-Katrina replacement high school in New Orleans was one of the first public high schools to be rebuilt following the devastation of the storm. 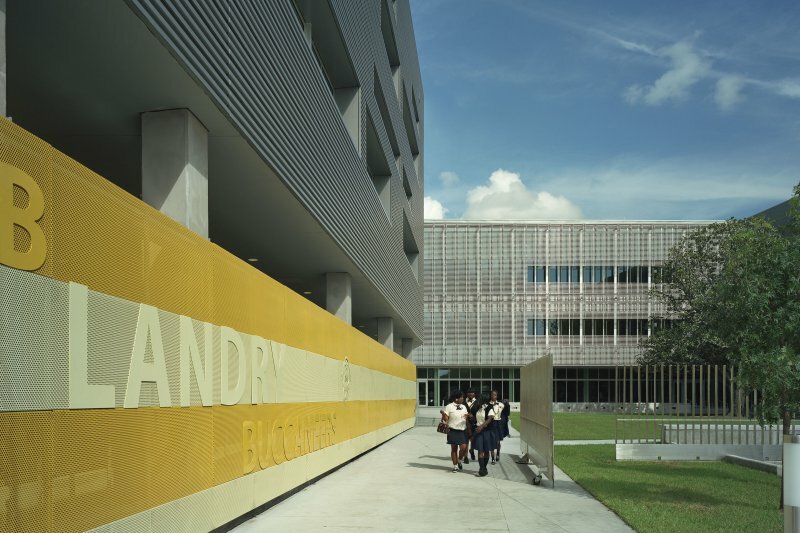 The school was part of a post-storm “quick start” program, intended to accelerate the replacement of five damaged schools within an extremely aggressive timeline, while a comprehensive masterplan for the New Orleans school system was simultaneously underway. The original school was founded in 1938 as the first high school on the West Bank of New Orleans that African-American residents could attend and only the second black high school established in Orleans Parish, and as such, has always retained a significant place in the city’s history. The design establishes academic ‘houses’ for each grade level provided within two classroom wings. The organization of these wings created a central courtyard around a mature existing Magnolia tree, creating a unique public gathering space for students and teachers alike. 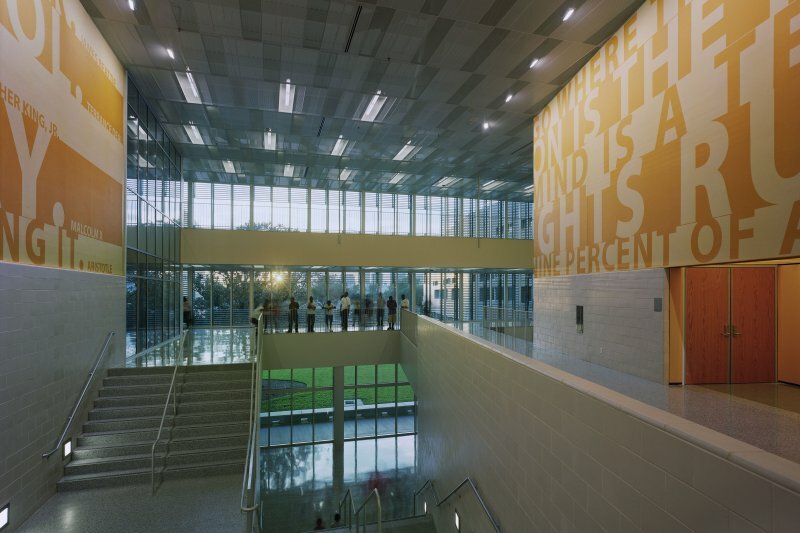 Within, the school houses a student population of over 900 students and contains a 1000-seat competition gymnasium, a 250-seat auxiliary gym and a 650-seat auditorium. Additional performing arts spaces include classroom and rehearsal spaces for dance, choir, band and art as well as a black box theatre. The media center/library as well as community health clinic are designed in a manner to provide after hours access to the general public for use as community resources. The building incorporates numerous sustainable design strategies. The exterior skin utilizes storm-resistant materials—masonry, insulated metal panels, impact-resistant glazing—that also contribute to energy efficiency. Locally-sourced interior materials such as terrazzo flooring and glazed masonry units were selected for durability, low emissions and high recycled content. 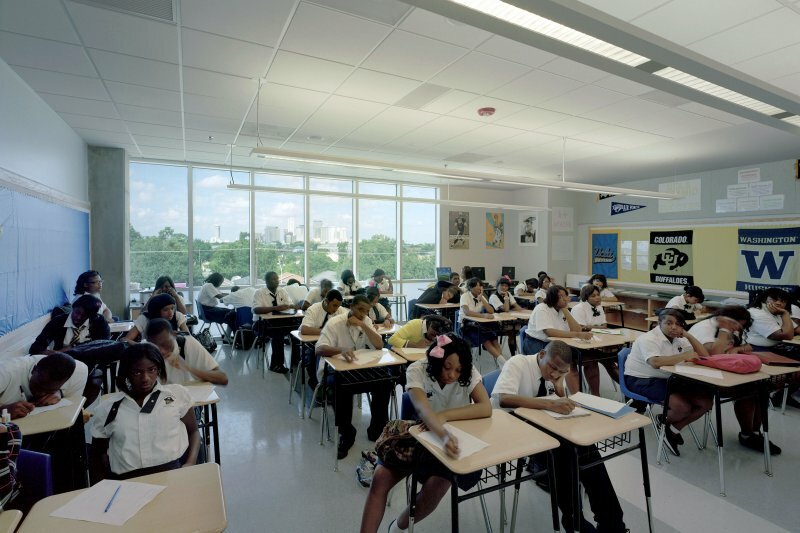 Daylighting is employed significantly in classrooms and throughout the common areas. Solar effects on exterior glazing are minimized by overhangs and sunshades on all but north facing walls. At its core, the project is designed to be a center of community. Due to its physical and social context, the school is intended to function as a protected oasis while simultaneously providing a measure of transparency, one reflecting the aspirations of the school to its surrounding community.